As this new year dawned and my confidence in my parenting skills plummetted, I mentally pieced together plans to make positive changes in 2009. Again, my over-all theme for the year is organization, and fixing my "hot spots" - like leaving for school on-time - could be accomplished via improved organization. For example, by preparing T's clothing the night before, he can be expected to dress himself down to socks by 8:00. By having the laundry completed (washed, dried, and put away) everyone can actually locate the socks I desire them to have on their feet! My husband had already built a cubby system in the garage long ago. We now use it. He pieced together a shoe rack from scrap wood by the door...now we all know where to find our footwear! These may seem like small details to some. To us, however, these changes have lessened our morning tension and improved our punctuality! In addition to these organizational changes, I also made some organizational - or company - changes. (I do, after-all, refer to myself as the COO of our family. I'm the Deputy in Charge while the CEO is off doing his day job.) I now have assistants. Helpers, we call them. Specifically, I have the Dog Helper. This individual's responsibilities include feeding the puppies at least once each day. (S)He also is expected to let the dogs in and out as needed (like, when the dog squats on my beautiful Friese carpet --- which, by the way completely hides puppy accidents and apparently resembles a giant field of grass to the common Golden Retriever). Also, I have the Bathroom Helper. This person wipes down the bathroom counter after the troops drip, drop, drool, spit, and spill their toothpaste at day's end. In addition, (s)he finds absolute glee in sparkling toilets and bathroom mirrors (OK, I do, but there's joy in a job well done for the little soldiers, as well!) 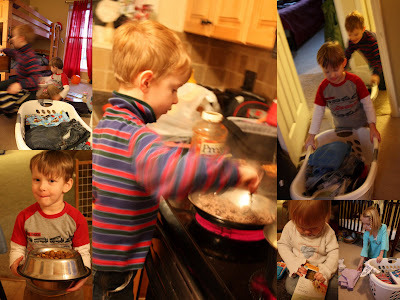 Finally, I have the kitchen helper who sets the table, stirs the pasta, and wipes down the table after each meal. Fringe benefits of Kitchen Helper include planning a favorite meal and choosing a dessert to make for the week. Also, (s)he chooses where (s)he sits at dinner and also says the family prayer. I have to tell you, in addition to putting away their laundry without even batting an eye, these two 7 year-olds and one 4 year-old are very hard workers. T spent one whole hour polishing our two toilets last week. He grinned from ear to ear when I handed him the Windex and said, "Clean those mirrors, Mister!" And you should see the way they are all clammering onto the kitchen counter to be the one to break the egg or stir the pot. I'm teaching them some life skills and, in the end, receiving some much-needed assistance, as well!